University Park, IL – July 27, 2017 – Bimba, an industry-leading innovator of pneumatic, hydraulic and electric motion solutions, has introduced IntelliAxis™ multi-axis electric Linear Robot actuators for either X-Z or X-Y motion applications. Employing a one-of-a-kind two-axis system, the unit features a single continuous belt that serpentines around the two axes eliminating the need for a motor in the Z- or Y-axis while driving a pair of coordinated motors in the X-axis. These configurations, known as T-bot and H-bot within the industry, permit synchronized control for complex motion movement profiles such as circles, ellipses and sine waves. IntelliAxis™ is intended for medium and heavy-duty two-axis industrial applications that require flexible motion within a two-dimensional plane. 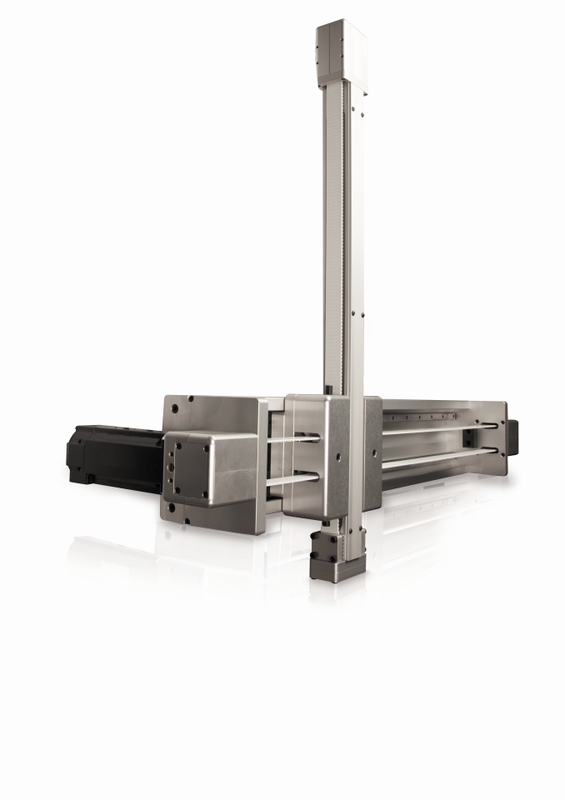 An optimal solution for applications that require X-Y or X-Z distance, high-speed motion with a robust load and moment loading capacity, IntelliAxis™ is ideally configured for pick & place, sorting, loading, assembly and other material handling tasks in industries such as packaging, food and beverage and automotive. The patented ARC Power Self-Tracking timing belt itself is steel-reinforced and provides motion in both axes. It is constructed to reduce noise and vibration, eliminate backlash and cogging and deliver higher thrust per unit size. “Ideal for high-speed applications, it is the most innovative and efficient timing belt in the world,” says Long. Bimba is a forward-thinking innovator providing industry-leading pneumatic, hydraulic, and electric motion solutions that are easy-to-use, reliable and ready for all engineering solutions. In partnership with its brands Acro, TRD, Vaccon and the Pneumatic Controls Group (Mead/MFD/Pneumadyne), Bimba markets an extensive line of industry-leading products: pneumatic, hydraulic, and electric actuators; valves; fittings; vacuum products; air preparation and a variety of safety and production solutions. In addition to its broad line of standard catalog products, the company’s business develops many custom and semi-custom products designed for specific customers and applications. These products, used in machinery and automation, are sold to original equipment manufacturers and end-users throughout the world in an expanding variety of industries.